Loose Change Lunchtime is a project based learning experience which sees the whole school focusing on money work for one week as part of Maths Week London. In groups of three or four, the Year 6 children work together to develop a concept for a ‘summer fete’ stall. This stall can be a game, challenge, shop or competition. Ideas include, Soak the Teacher, Tombola, Basket Shoot, Marble Rolling, Name the Teddy and many more. 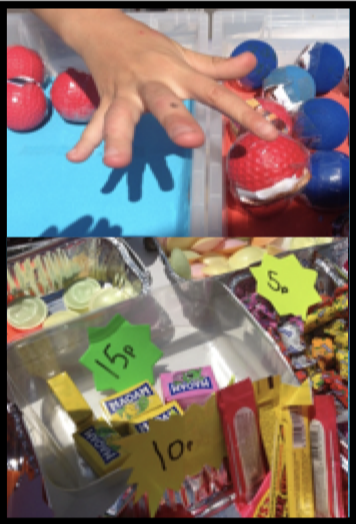 Children must work together to fully cost their idea, predict profit and loss (based on sales) and ensure that they remain fully stocked for the whole week with prizes, food or resources. During the project they learn how to use spreadsheets, sort money, calculate stock levels, understand graphs and estimate profits. They also learn key skills including communication, collaboration and create persuasive radio adverts. Loose Change Lunchtime then takes place in the school playground every lunchtime for one week. Following each session the children must count the money, enter profits or losses into spreadsheets and recalculate their stock levels. By Friday there must be no stock left. It’s a great project and one which has been running at Anson for over 10 years.